We are pleased to announce the exhibition 12 Views of Venice, 2018 which features drawings by thirty-seven architecture students from ETH Zurich, University of Tsukuba, and The University of Queensland, who participated in the Architectural Ethnography Summer School in the Japan Pavilion at the 16th Architecture Biennale in Venice. 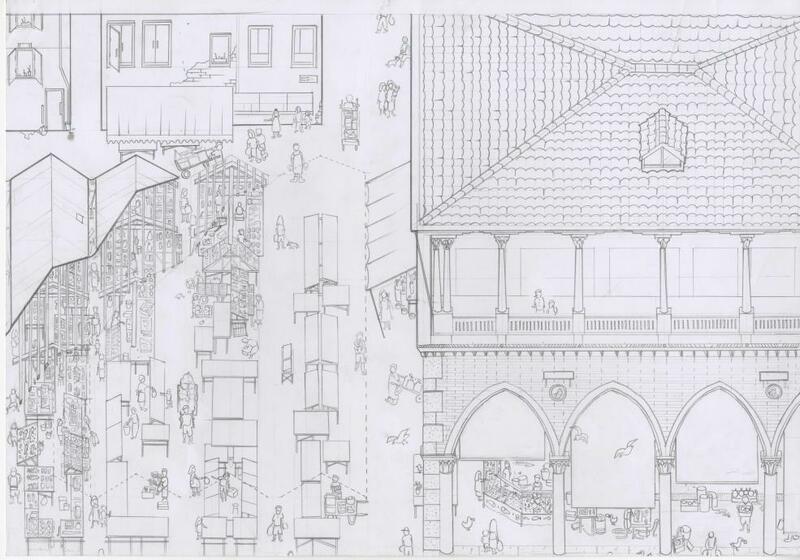 Through the means of collaborative pencil drawings, the school explored twelve different public spaces in Venice, both at the centre and at the periphery. Views of the city from the fifteenth to the eighteenth century provided the school with a common starting point. Using these references, students surveyed the interrelations between human behaviours and architecture, and between past and present. The result is an urban portrait that reinvents how we imagine Venice by connecting the spaces of tourists with those of locals, and the clashes of modern life with the rites of past centuries. The school was part of the Japan Pavilion at the Venice Biennale curated by Momoyo Kaijima (Atelier Bow-Wow) with Laurent Stalder and Yu Iseki. In addition to the drawings, 12 Views of Venice, 2018 includes photographs of the pavilion and copies of its catalogue, emphasising how the school was an opportunity to learn from the collection on display. The pavilion showcased forty-two works from all over the world, produced in the last twenty years. These ranged from design specifications and spatial activity charts, to maps of urban hybrids as well as large studies of rural farming and fishing villages following natural disasters, originating from university design studios, architectural offices, or artistic practices. They all reflected the search for a new approach toward society, which the pavilion curators termed ‘Architectural Ethnography.’ In this sense, the school at the Japan Pavilion learned from Atelier Bow-Wow’s long-standing investigation into the interrelations between human behaviour, built architecture, and its environment and resources.